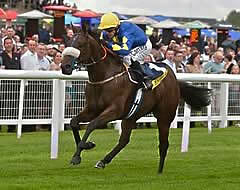 Caspar Netscher produced a surprise of sorts in landing the AON Greenham Stakes at Newbury for Alan McCabe. In a race hit by the ground-enforced absence of Top Offer and Tales Of Grimm, Dewhurst fourth Bronterre was sent off the 8-11 favourite. Ryan Moore's mount was keen in the opening exchanges in tracking leader Spiritual Star, but all looked well approaching the quarter-mile marker. However, he did not go clear in the manner expected, and was collared by Boomerang Bob before Caspar Netscher (3-1) swamped them both at the furlong pole when switched to the stands rail, recording a length success under Shane Kelly. McCabe said: "He'd got the best form in the race. He didn't relish the ground, but he wanted to win. He improved all of last year and he's still improving from what we have seen. "He's got to go for the (2000) Guineas and Charles (Wentworth, owner) had an agreement that whoever rode him in the Greenham will ride him in the Guineas." Richard Hannon said of Bronterre: "They went off too fast. I thought he'd go away and win, but that didn't happen. We will just have to see how he is."